Where does a river start from? Every river has a 'source', a place where the river begins its journey. The source of a river is usually found in high places such as hills or mountains. 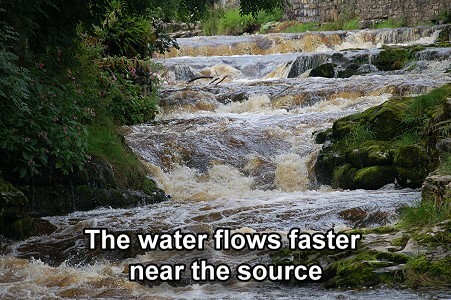 A river can have more than one source. Some rivers begin where a natural spring releases water from underground. Some rivers begin in mountains or hills, where rain water or snowmelt collects and forms small channels, . At first, the channels are small and are called rills. As more water enters the channels they grow forming gullies (larger channels). 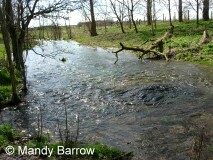 The streams in the gullies eventually become big enough to form a river. The source of some rivers is a lake. The source of the River Nile is Lake Victoria, in Burundi. In some places, rain water can't sink into the ground as the ground is too wet already. The water forms a bog. The water flows out of the bog to form lakes and streams.